InstaForex took part in the international exhibition in Kiev –the capital of Ukraine – on December 19 – 20, 2015. The hall of Hyatt Regency Kiev hotel has already become a traditional site for business meeting and communication. 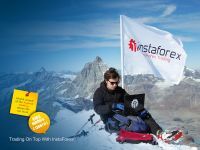 Win BMW X6 from InstaForex – new super campaign! InstaForex!This time, a winner will become an owner of a high­-powered luxury crossover of 6­series by legendary German automaker BMW. InstaForex wishes everyone a Merry Christmas and a Happy New Year! Please pay attention to some changes in trading hours during Christmas and New Year holidays from December 24th, 2015 to January 4th, 2016. If you have any other question, please do not hesitate to send me a message here in this platform. I would like to represent InstaForex Company here in this topic. I will be glad to get feedback regarding our services and interesting offers from you. Do not hesitate to ask any question about trading and InstaForex Company, I will be glad to support everybody. See What Others are Doing!